You have received this email as a service from The Complete Wealth Management System to keep you informed about important issues and strategies that affect your long-term financial success. Commissions, trailing commissions, management fees and expenses all may be associated with mutual fund investments. Please read the prospectus before investing. Mutual funds are not guaranteed or covered by the Canada Deposit Insurance Corporation (CDIC). For funds other than money market funds, unit values change frequently. For money market funds ,there can be no assurances that the fund will be able to maintain its net asset value per security at a constant amount or that the full amount of your investment in the fund will be returned to you. Past performance may not be repeated. The information in this email newsletter is general information only and is the opinion of the owners and writers. It is not intended to provide specific personalized advice including, without limitation, investment, financial, legal, accounting or tax advice. The information contained here may include estimates, projections and other "forward-looking statements." Actual events may differ substantially from those presented herein. We make no representation that future investment performance will conform to past performance and it should never be assumed that past performance foretells future performance. All information provided is believed to be accurate and reliable, however, we cannot guarantee its accuracy. Please consult an appropriate professional regarding your particular circumstances. Worldsource Financial Management Inc. will not be held liable for any inaccuracies in the information presented. 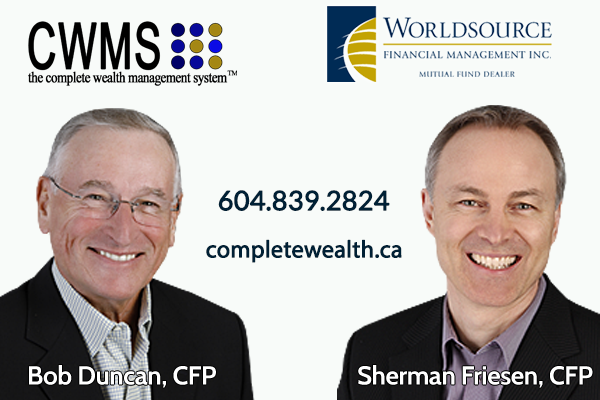 Mutual Funds provided by the fund companies are offered through Worldsource Financial Management Inc. Robert Duncan is affiliated with RIS Insurance only and does not offer products and services through Worldsource Financial Management Inc. Insurance & segregated fund products are sold by Sherman Friesen personally and not through Worldsource Financial Management Inc.